"Knocked Out Loaded" begins with this cover of an older and obscure blues number. Dylan and his band do a very enthusiastic take, and above all, 'You Wanna Ramble' is very entertaining. Bob and crew achieve a raw blues/rockabilly groove, but with a strange touch. This is one very dark song, yet it's belied by the bounciness of the band. Lyrics include "...the night is so empty/ so quiet and still/ for only fifteen hundred dollars/ you can have anybody killed" and "..what happens tomorrow/ is on your head, not mine". From the get-go, this track and performance lays the entire template for "Knocked Out Loaded": life is full of contradictions, sorrows, joys and varying ideals. A major sticking point for listeners is that there are so many different musical styles, and many different lyrical directions to be found on this album. What has been interpreted by many is that Dylan isn't sure where he wants to take this album, that it lacks cohesion, resulting in blues, reggae, gospel, and rock seemingly programmed randomly. I see it much differently, however; Dylan knows *exactly* what he wants to achieve. There is indeed an overarching theme present in "Knocked Out Loaded", but it's not immediately identifiable. This is invariably the track that is singled out by this album's detractors. The Kristofferson song is accused of being ill-considered and maudlin by many, as it contains references to Gandhi, Martin Luther King and Jesus Christ. As a song, 'They Killed Him' is fairly simple, and will probably never hold great appeal to many listeners without a religious interest, while the children's choir that briefly appears is almost always despised by listeners. If "Knocked Out Loaded" has a flaw, it is this track. But there's more to 'They Killed Him' than just being album filler. By the time Dylan arrived in 1986 his overtly Christian period was long gone, at least as far as his albums were concerned. At the time it was widely rumored that he had renounced Christianity and embraced Judaism again. Onstage during his joint tour with Tom Petty Dylan dropped not so-subtle hints that he hadn't, introducing 'In The Garden' by saying Christ was his hero. Apparently not many noticed. But when he released 'They Killed Him' it couldn't have been more plain. Kristofferson's song served Dylan in two ways at this particular point in time; it not only was a major way for Bob to remind his fans that Jesus was still part of his life, and it also made a statement about socio-political turmoil. This is especially interesting, because although Dylan has always been associated with the counterculture and a symbol of unrest, aside from his very early songs he almost never touched on these matters. The album prior to this one, "Empire Burlesque", contained a song about Vietnam and it's devastating effects on those who fought, 'Clean Cut Kid', but it was a pretty lousy song. With the obvious feeling he puts into 'They Killed Him', he elevates this song from ordinary to something profound. The children's choir, well, it doesn't add anything to the recording but neither does it really hurt anything, just an experiment. Some fans contend this track was included as a 'joke', but his longtime friendship with the song's author, as well as his heartfelt performance (not to mention the subject matter) would suggest this theory to be weak. 'They Killed Him' deserves inclusion on this album because it demonstrates how much soul Dylan possesses, and it's a revelation. The first of only two compositions entirely written by Dylan, this is one of the greatest of his so-called 'minor' songs. This was a few years old, as bootlegs attest., but with several rewritten lyrics. And the lyrics! Amazing stuff, finding the singer confronting a failing relationship with regret and spiteful honesty. Dylan has been on similar territory before - plenty of times before and after - but never with as much lucid imagery or symbolic humor. "...Well these times and these tunnels are haunted/ The bottom of the barrel is too/ I waited years sometimes for what I wanted/ Everybody can't be as lucky as you" and "...You and me we had completeness/ I give you all of what I could provide/ We weren't on the wrong side, sweetness/ We were the wrong side" are as mysterious and inspired as any in his vast arsensal. The usual charge against 'Driftin' Too Far From Shore' and, indeed, the entire album, is the "big '80's" production (loud drums, keyboards, with sound too compressed). Well..yeah. This was 1986, was it not? I could understand that being a valid criticism if the album had been recorded in 1993 and sounded that way (for a good example of this, see the Guess Who album "Lonely One"), but in this case it's just...kind of like stating the very obvious without really stating anything. The mix and production of this song is dated, ok, but also very charming and perfectly atmospheric. 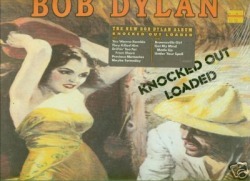 Besides, Dylan is no fool: the production is also raw, resulting in a thoroughly intriguing sound throughout "Knocked Out Loaded". But back to the track itself. 'Driftin' Too Far From Shore' is bouncy, catchy and immediate, being the one track that instantly hooks the listener in. There would be no commercial concessions on this album, yet this track is as close to commercial as the record gets. Why this one was not chosen for a single, and is continually passed over for compilations, is beyond my comprehension (unless Dylan has a 'rediscovery' plan in his mind).